In this interview we were pleased to welcome Phoebe Frampton to ARZone. Phoebe is a vegan activist and artist and has been organising various activism events and campaigns within the vegan movement for 7 years. 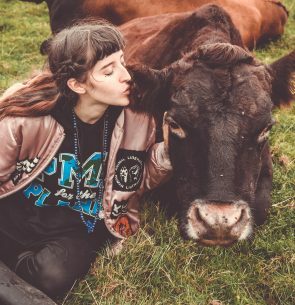 She and her sister together founded activism groups ‘London Vegan Actions’ and then ‘The Earthlings Experience’ which became a new form of activism, with events taking place in more than 100 cities worldwide. She also performs spoken word and poetry to raise awareness about different injustices towards humans and other animals and encourage one love for all beings. We spoke with Phoebe about The Earthlings Experience, about 'infighting', about showing footage without the consent of passersby, showing happy footage and much more. To listen to this interview, please CLICK HERE or use the player below. © Copyright www.arzone.net 2010-1016 Carolyn Bailey. Awesome Inc. theme. Theme images by wingmar. Powered by Blogger.